Boarding a cruise ship in Miami is not for the faint-hearted. Our taxi driver, probably unhappy that the ride from the InterContinental Hotel was to the nearby cruise port and not the airport, hurtles along the waterfront and drops us amid a throng of souls looking for porters. In America porters often wear red caps. Few wear morning dress, so when I see one bloke’s formal attire I know this is our man. Moments later we are being escorted into the terminal, and skirting a long line of check-in desks, we are shown into an cozy lounge, offered a soft drink in a champagne glass, then escorted on to the ship by another bloke in morning dress. Welcome to MSC Divina, says a receiving line of smiling waiters. We nod and take a lift to deck 16 and the Yacht Club. This is the inner sanctum of Divina, a ship within a ship, where champagne glasses are the order of the day, although the bubbly is usually prosecco. MSC, a huge Italian container line based in Geneva, is also known in the cruising world as the operator of very big cruise ships popular with European families whose children under 11 get free passage. Cheap and cheerful would sum it up, but the pizza and ice cream were always brilliant. Then a few years ago the line made a move that surprised the industry. It built a new ship with a separate, exclusive area that required special admission cards, and they called it the Yacht Club. It made sense too, for big ships have a lot more going for them in terms of entertainment and dining options. Divina’s Yacht Club was launched with great flair by Sophia Loren, who even designed her personal suite, 16007, with a carpet described as “wild heather and red.” All of the 69 Yacht Club suites are larger than others on the ship, where nearly 4000 passengers, and swarms of children, reside. But there is space galore for everyone, for Divina is a hefty 139,400 tons, and if you recoil at the idea of a large ship, consider that vessels of this size are very sea-kindly. In other words they don’t rock and roll, and even on the North Sea you would hardly know you are afloat. Some of the features of the Yacht Club are shared with the main ship, such as the handsome staircases with Swarovski crystal. In fact the decor of the entire vessel, while not retiring, is quite tasteful. I was impressed with the size of the spa and gym, the latter having epic reviews forward. This is a real incentive when cruising, where everyone is said to add one pound a day, easy to do on Divina where the buffet restaurant is open 24 hours. Forget the old jokes about novice cruisers asking what time is the midnight buffet. Here, it never stops, including the delicious thin-crust pizza. Of course this ship is Italian through and through, and you can’t beat them for service and charm. Although there was a number of alternative restaurants, at a price, I never felt the urge to stray from the Yacht Club’s private dining room, where the food and wine were invariably very good. Mind you, not all Yacht Club passengers were thrilled that their dining room was at the stern of the ship. I found it an interesting experience to walk almost the entire length of the 1092 ft vessel every night, recalling Upstairs-Downstairs times in the past when ocean liners had multiple classes with first class on top, and it was said that while the food was better in first the dancing was livelier in second. Shows were certainly fast moving with dancers and a superb Michael Jackson impersonator. No comedian though, as there were too many languages on board. However English is always first. Divina tries hard to entertain with a Formula 1 simulator, a “4D motion ride”, films on deck, and of course a casino. No bridge, but there is napkin folding, ping-pong and bingo. Wifi, as in all ships, is not cheap, and savvy passengers use connected cafes on shore. Another reason to slip downstairs is for live music and dancing, found in several of the dozen or so bars, as are lots of nocturnal children. The Yacht Club lounge, where drinks are included, makes a good base from which to pop downstairs, with your drink of course, when you’re in the mood. The lounge also has fine views forward, serves breakfast and lunch, and can be sociable, rather like the club floor on an expensive hotel. A private lift takes Yacht Clubbers to their exclusive deck area, which has a small pool, another bar and service for breakfast and lunch outdoors. Beware the self-service free ice cream machine! Four MSC ships have Yacht Clubs and all seven new ships on order will have them, one difference being that the private dining rooms will be located forward, making the Yacht Club literally all-inclusive. Fair enough, but I’ll still go below, with my drink. THE CRUISE – Divina sailed the Eastern Caribbean, to St Martin, which is part Dutch, part French, popular for duty- free shopping, but check prices before you leave home; San Juan,capital of Puerto Rico, well worth a city stroll to see the handsome Spanish colonial buildings, and the fort; and Grand Turk Islands, blissful beaches and swimming with with stingrays. COMING UP – MSC Divina sails a series of seven-night Western Mediterranean cruises this summer from La Spezia, Italy; calling at Cannes, France; Palma, Majorca; Barcelona, Spain; Naples, Italy; Civitavecchia (Rome), Italy; and Genoa. 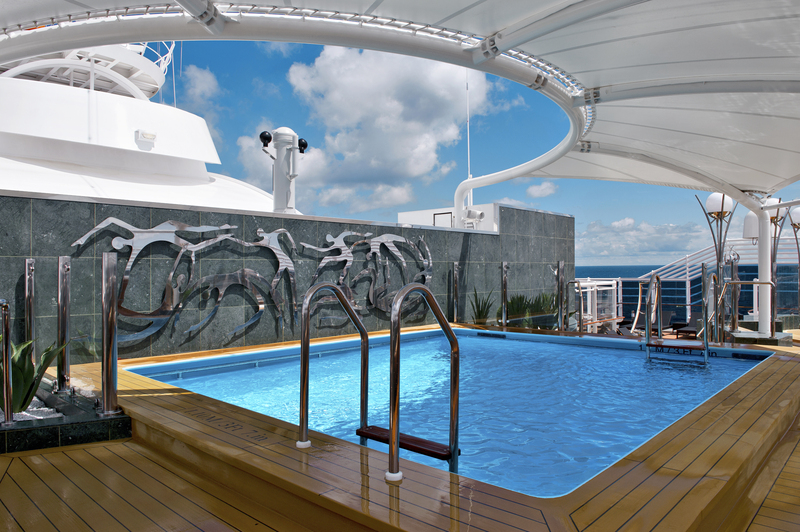 Cruise-only prices start at £529pp, with deluxe Yacht Club suites available for £1,749pp (based on June departures). The ship returns to Miami in November for a winter of seven- and 14-night Caribbean sailings. Seven-night cruise-only itineraries from Miami call at Falmouth, Jamaica; George Town, Cayman Islands; Cozumel, Mexico; Nassau, The Bahamas; and Miami, from £399pp. Deluxe Yacht Club suites are available from £1,539pp (based on December departures).